So one of my goals this month was to limit my pocket money to $20 for the whole month of April. My most frequent splurges are lunches out with friends, coffees, books, thrifting, the occasional trip to Target or Joann's, and online shopping when I find a good deal for something I think I need or it's cheap so I should "stock up". It was kind of a spur of the moment thought due to several things. Here were a couple of my reasons. I don't know how much I spend each month. I don't have any limits on how much I can spend a month. I mean, I think if I was charging up hundreds of dollars a month, my husband, Jim, might say something. But, as it is he always encourages me to spend time with friends or treat myself if I feel like I need to. And while I love his support and trust in me, I feel like I should be more responsible with how I use our resources. I want to take two trips this summer. One up to Lake Superior and another to Colorado. While I'm traveling with friends, and we travel relatively frugally, it's still going to take some dough to fund these. While Jim and I have a joint checking account, and we never talk about my money or your money, I feel like I should be making some cuts to my spending to make up for the extra travel. After all, if I was single I would have to do this. I have too much stuff! I am always seesawing between trying to declutter my house and finding great deals or the perfect something. I know I have too much stuff- whether it's books or fabric or lipsticks or stationery, I have a tendency to hoard things. But, then I justify it to myself by saying that I'll use it all eventually. Time to start using it all. April 14 $4.00 for DairyQueen blizzard for treat for Hubs. It's going to be a rough go to only spend $2 the rest of the month, but even if I go over, I've already realized a lot about my spending habits, and I do plan on tracking what I spend more closely in the future. What do you think? Do you track your monthly spending? Where does most of your pocket money go? Any tips to help you keep your money in your pocket longer? And I'll be sure to update you all on how the second half of the month goes. Ugh! April is flying by. 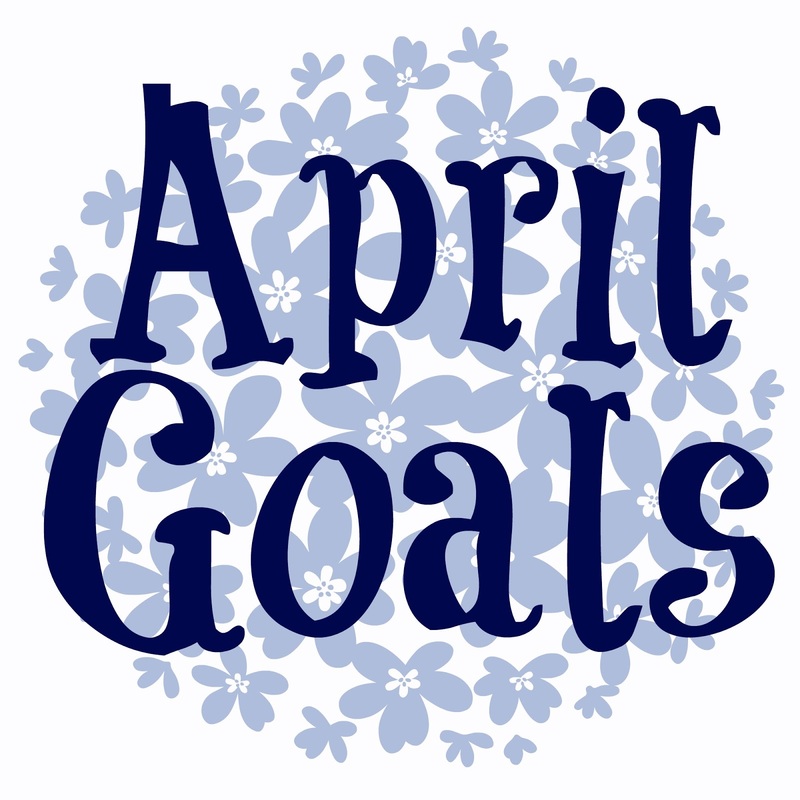 My goals group met March 30 to go over our plans for April but I never got around to posting them here. There's been a lot going on around here, and I'll detail it all out in a future post or two, but for now here's a recap of March and look at what I'm hoping to get done in April. Read four books- No go, only got through three. Daily devotions- Did pretty good. We'll call it a win. Exercise five times a week for 30 minutes a time- Only managed about four times a week. Finish kitchen curtains- Ah... no. Make one item of clothes for me- Ah...no. Plan meals- Worked on it. Made some things that allowed leftovers for work lunches and worked at making good food choices, but didn't actually plan meals. Write daily in some form: mail out a card to a friend, journal, writing exercises- Did better, but still didn't make it everyday. 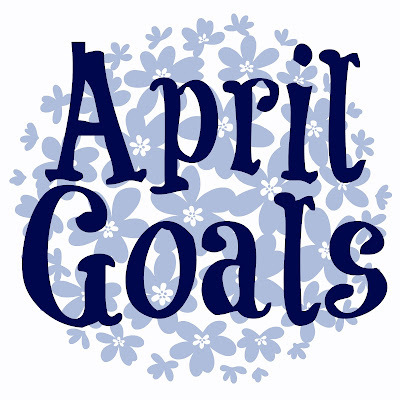 So, while I made progress on a lot of goals, I just didn't get as much finished as I had hoped. Read four books. I know I list this one every month, but my goal is 48 books a year, so I need to break it down to bite size chunks. Daily devotions and prayer time. I've been reading a book about prayer and have really been striving to incorporate it into my daily life. 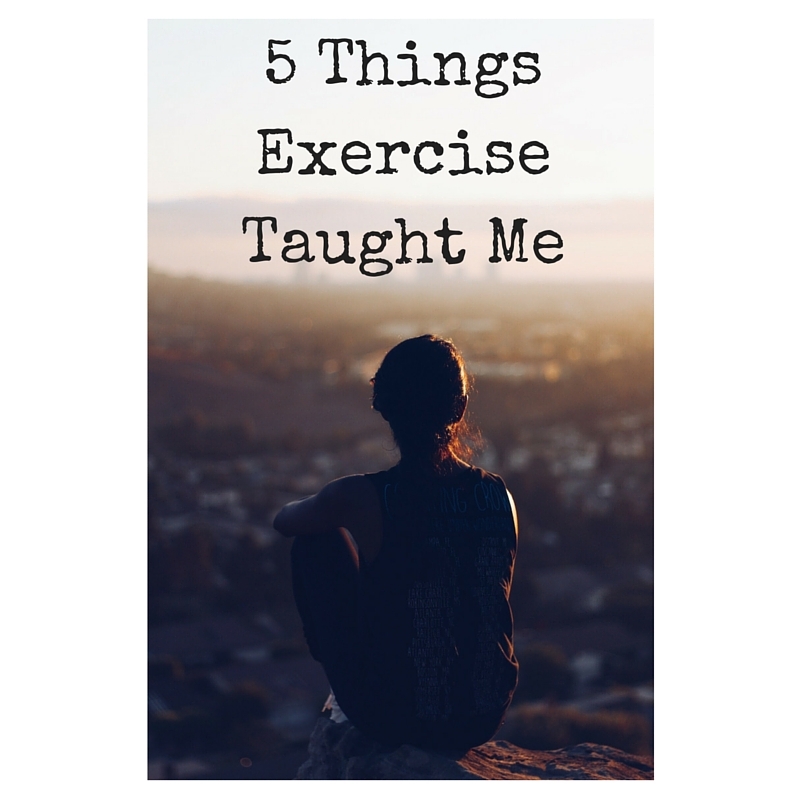 Exercise five times a week for 30 minutes a time. Repeat of last month's goal, but now that it's getting a little nicer, I'm hoping to get out more. 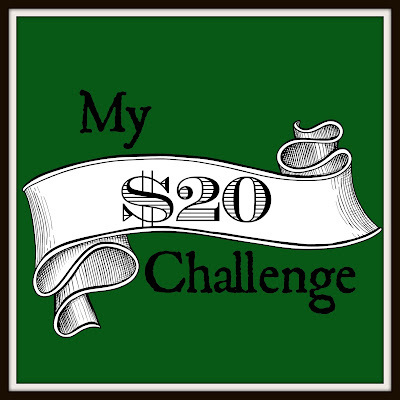 Limit myself to $20 pocket money. This is for things like coffee, snacks at work, online shopping, clothes, ect. I'm trying to declutter my life and by not bringing in a bunch of new items, I'm hoping to make headway. Declutter home. I've thinned out my clothes last fall, but there's things like dishes, craft supplies, books, and more that I can do better at. Write daily in some form. Just can't seem to get this down! We're trying again in April. You can follow along on the link up over at My So Called Chaos to see what everyone else is working on this month, or if you blog, join in! I'm hoping for a more productive reading month in April than I had in March, but it's already the ninth, and I still am finishing a book from last month. I have lots I've wanted to write, but it's been very busy and between work and other things, I haven't had much time home alone to work out my thoughts, but I'm hoping to remedy that in the coming week. Anyhow, here's my reading picks for the coming month. Like Water For Chocolate by Laura Esquivel- I knew a movie was made based on this book, but that's about all I knew about it. My mom picked it up for me at a book sale, thinking I'd like it. It looks intriguing and I unfortunately don't read a lot that is not written by white American or European writers, and I really need to broaden my book horizons. The Man Who Loved Books Too Much by Allison Hoover Bartlett- Goodreads describes this one as being similar in style to The Orchid Thief, which I surprisingly enjoyed, and Erik Larson wrote a little blurb calling it "Compelling, with elegant suspense." and I really like his books so I decided to pull it off the shelf. I got this one from my Broke and Bookish Christmas swap partner last December. 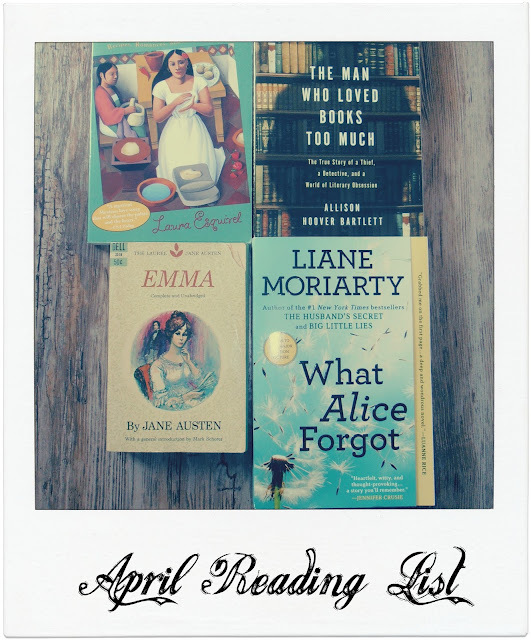 What Alice Forgot by Liane Moriarty- I haven't read any of Moriarty's books yet, but they always sound intriguing. Waking up to discover I'd become the exact type I've always vowed I'd never be would be horrible and I can't wait to unravel this one. It came from Diana at Book of Shadows in the January Book and Cuppa Swap. And finally... Emma by Jane Austen- I love the movie with Gwenyth Paltrow, but I've never read the book. I really need to remedy that. Plus, it's a good excuse to watch Emma (and Clueless for that matter) afterwards. March was not a very big reading month, but I did find quite a few new books. Some that I had been on the lookout for for quite a while. In the Garden of Beasts by Erik Larson. This is the second Erik Larson book I've read now. I really like his style of writing nonfiction that reads almost like fiction. He meticulously researches his books and provides a lot of details you wouldn't get in a history book. This time, he focuses on the Dodd Family. William E. Dodd, the father, was appointed U.S. Diplomat to Germany in 1933, between World War I and World War II, shortly after Hitler became Chancellor to Germany. He takes his wife and two children, who are both in their twenties, with him. Dodd faces opposition from other U.S. Diplomats due to his no frills lifestyle and directness. His daughter carries on several affairs with everyone from Nazis to Soviets to other countries' diplomatic officials, which was quite scandalous and his wife just wishes they could be back home. It was not an uplifting or happy read, but did help fill in some of the extensive gaps in my knowledge of history during this time. It was very interesting and I can only imagine how frightening it must have been to reside in Germany during this time. Granted, diplomats were given special treatment due to their status, but just to witness this time period would have been frightening. Murder in Three Acts by Agatha Christie. This is a Hercule Poirot mystery and went places Christie's novels do not traditional go, which was refreshing. I like the character of Egg and Poirot is always fun, the story was unique, but it wasn't even close to being one of my favorites of hers. But, there's really no such thing as a bad Agatha Christie mystery. Be Wise by Warren Weirsbe is a commentary on the book of 1 Corinthians. I love his commentaries, because they provide a lot of information, but they do it in a way that is still easy to read and comprehend. They're like a nice refreshing salad- variety and everything you need, without anything you don't. Bird by Bird by Anne Lamott had been on my wishlist for quite a while. I think it's clear by now that I'm a big fan of hers. I found this on Bookmooch. Still Mine by Amy Stuart also came from Bookmooch. I read a review from Book of Secrets. It sounded good, so on a whim, I looked for it, and actually found someone from Canada who had it up for swap. 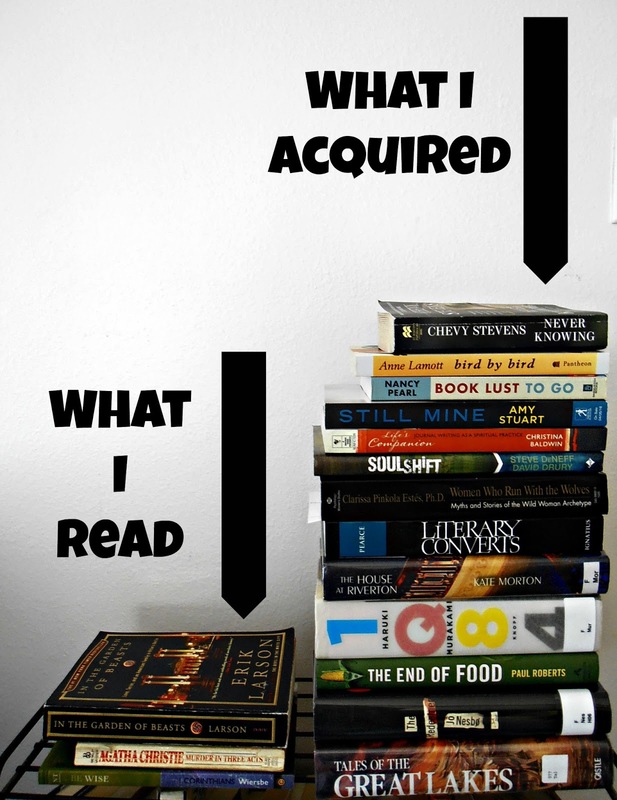 Book Lust to Go by Nancy Pearl was found on the clearance shelf at Goodwill. I love the Book Lust books. They're just lists of books sorted by topics, sometimes with a line or two about why she's recommending them. This one is sorted by place. Literary Converts by Joseph Pearce was sent to me by a friend. We often talk about writer friendships and how they seem to encourage and influence each other. This book focuses on the faiths of a lot of the authors we seem to mention regularly. Life's Companion: Journal Writing as a Spiritual Practice, Soul Shift: The Measure of a Life Transformed, and Women Who Run with the Wolves were all discovered at the little thrift store here in town. The last one is the only one I had heard of before but for fifty cents each, I figured it was worth the gamble. And finally, at the library book sale in a nearby town I got: Never Knowing by Chevy Stevens, The House at Riverton by Kate Morton, 1Q84 by Haruki Murakami, The End of Food by Paul Roberts, The Redeemer by Jo Nesbo, and Tales of the Great Lakes. If you want to read more about any of these books, just click the title to be taken to the Goodreads page of each book. Guess I better get reading!